Please note that I fill orders personally, not via an automated process. Therefore, there could be an hour or more delay. Files are sent as an attachment to an e−mail. See COMBO prices for deals. Site License allows an unlimited number of users at one (1) location. Users must be officially affiliated with the site during the time of use. That means the license does not follow a user who permanently leaves the site (graduation, new employment, etc.). The license extends to persons whose primary job is normally performed at that location, but works occasionally from home or at a remote location. Hobbyists employed at the same location are welcome and encouraged to use the software. The single location restriction is imposed to limit distribution to local use for companies with multiple physical locations. This software may not be redistributed in any form, nor posted on the Internet or anywhere that it can be publicly accessed. The file(s) may be distributed on a server, via e-mail, etc., as needed. Because the price for RF Cascade Workbook 2018™ is so low, I cannot provide any level of assistance with setup or operation. After all, you're getting an amazingly feature-filled program for less than an hour of an engineer's billable time. Reported errors, if any, will be addressed ASAP. You must enable macros to run or you cannot use RF Cascade Workbook 2018. Excel 2007 & Windows 2008 or newer. These instructions and screenshots were made in Excel 2007, so your screen and menu placements might be a little different. I verified that everything works fine all the way through Excel 2016. Here is the complete Help Page from RF Cascade Workbook 2018™. RF Cascade Workbook 2018™ is protected by United States copyright law. Unauthorized copying, alteration, or distribution of this spreadsheet is prohibited by law. As a lawful owner of a RF Cascade Workbook 2018™ user license, you are permitted to make modifications for your unique application; however, this workbook may not be modified and distributed or sold as a new product. Disclaimer: RF Cascade Workbook 2018™ is offered AS IS. Your use of RF Cascade Workbook 2018™ implies you alone accept responsibility for results obtained through its use, and will hold harmless Kirt Blattenberger, RF Cafe, and all legal assigns for any losses incurred through its use. RF Cascade Workbook 2018™ has been tested very thoroughly, and there are no known problems at the time of this release. Discrepancies that affect accurate results, if discovered, will be fixed ASAP and a replacement version will be provided at no cost. 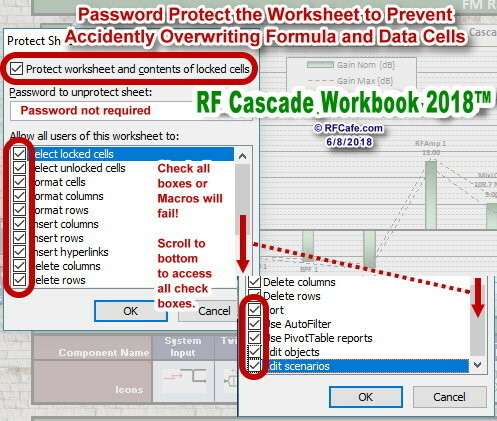 Also, any and all User modifications to RF Cascade Workbook 2018™ - other than entering values in the provided Unlocked cells, negates any and all responsibility by RF Cafe for the integrity of the software. Unprotecting a worksheet negates responsibility by RF Cafe. There might be minor differences between the current version of RF Cascade Workbook 2018™ and what is shown in these screen captures. For more than a decade, RF Cascade Workbook 2005™ has been the de facto standard for spreadsheet-based RF system cascade analysis. RF Cascade Workbook 2018™ is the next phase in the evolution. If you know how to use Excel and you know anything about cascaded system calculations, then you know how to use RF Cascade Workbook 2018™ (formerly Wireless System Designer™). This is significantly easier and faster than using the multi-thousand dollar simulators when a quick system analysis is all that is needed. Hundreds of hours have gone into developing this tool. Please see RF Cascade Workbook 2018™ intro video below for an overview of features. 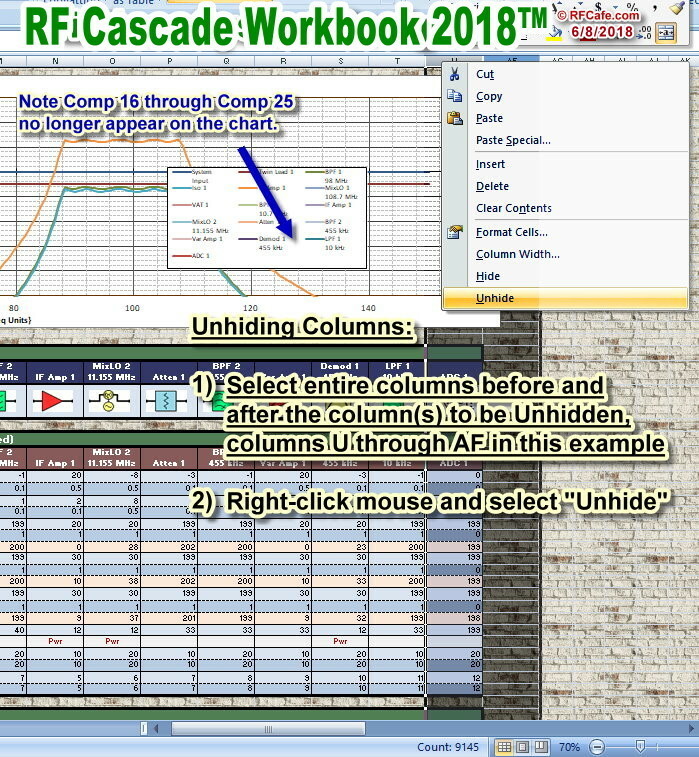 Excel's cell comment feature is use extensively to provide guidance for RF Cascade Workbook 2018™ (RFCW). The contents of all the hints - and more - can be found on the "Help" worksheet (click the tab at the bottom). 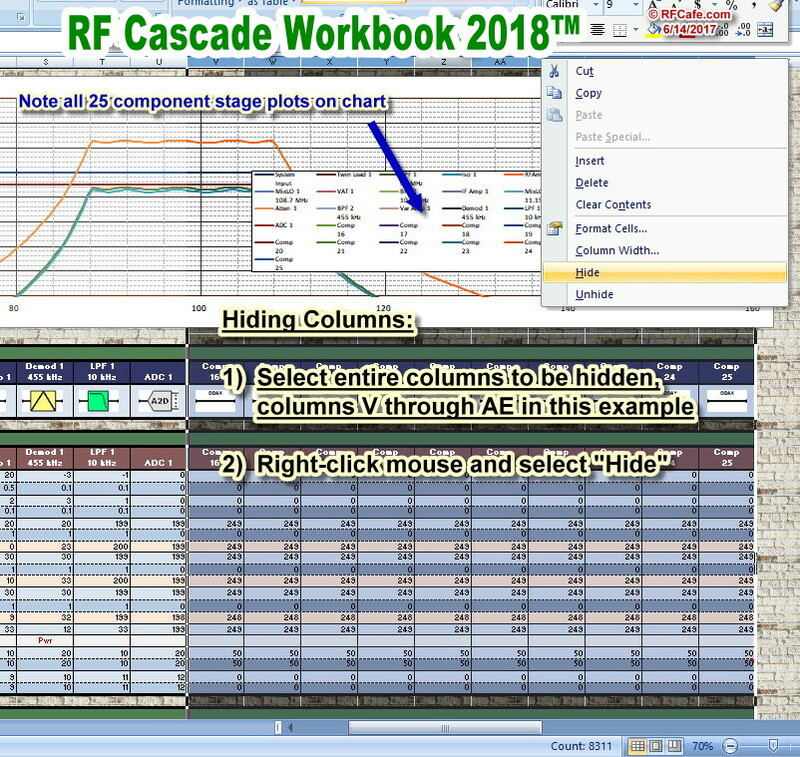 The "Help" worksheet, cell mouse-over comments, and this web page comprise the totality of documentation for RF Cascade Workbook 2018™. There is no separate document available. RF Cascade Workbook 2005™ User's Guide should also be useful since it extensively documents formulas. Combined, there is a lot of information about not just how to use RFCW, but also how cascaded system analysis works. RF Cafe is also chock full of related information, so one way or the other, you're covered. 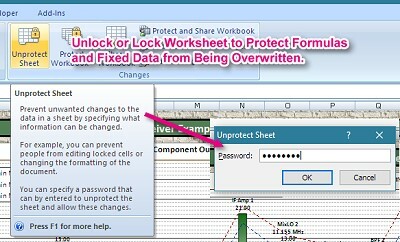 Use Excel's Protect Sheet and Unprotect Sheet commands to lock and unlock, respectively, the cells. Use the Password provided in the e-mail sent to you with the file attached. I will be glad to provide it to you again with a proof of purchase. When Protecting the worksheet, be sure to select ALL the check boxes in order to ensure that the macros will run (click thumbnail above). You might need to scroll down in the window to access all the check boxes. See Worksheet Protection information on the RFCW "Help" page. Please see this separate page with screen shots and directions showing how to insert and delete columns. Since the complete worksheet occupies nearly 900 rows, a convenient drop-down menu is provided to move up and down the page. Information necessary for the navigation to function is in the cell behind the menu, so if you accidently overwrite the cells, navigation no longer works (keep Protection turned on). Rather than deleting and/or adding component stage columns, it is much simpler to Hide and/or Unhide columns. Doing so retains all the information without having to go through all the steps needed for deleting and/or adding columns. All the input and calculated is retained and included in the overall output, but the Hidden stage columns are not included in the charts. Hiding component stage columns can be a good way to exclude unneeded plots from the charts without requiring you to delete/add data series - which is itself a pain to do. Charts are pre-configured for plotting all calculated cascade parameters. Auto-scaling of the axes is the default, but you can change all aspects of the chart formats per Excel standard. Select chart to display using drop-down menu. These four top-level overall system parameters are used for many calculations. Be sure to define them along with the individual stage component parameters. Build your system block diagram using the provided images or make your own. 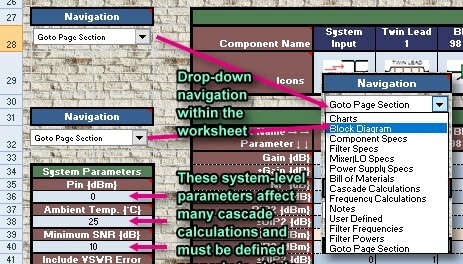 Click on the "Icons" tab at the bottom of the page to access and copy the desired icon (58x32 pixels), then paste it into the block diagram. Use Excel's standard Objects alignment and spacing tools for a perfect layout. Enter each stage's nominal and tolerance values. Error checking is provided for exceeding power or gain limits (see below), no negative noise figure (NF), making sure NF is equal to absolute value of a negative gain component, etc. Errors are reported in the "Status" cells. Two rows f user-defined cells are provided for formulas along with a "User Defined" chart that displays the cell data. Set maximum values for stage component input parameters. These values are used for Data Validation in the input parameter cells. This results in a limit where the charts auto-scale, since entering a null value of, say +999 dBm for IP3 will render its affect utterly unnoticeable by the system, the IP3 chart will auto-scale to +1000 dBm or more while the IP3 level in your actual system might be a maximum of +50 dBm. The useful data would then be crunched almost entirely at the bottom 5% of the chart. Of course you can always go in and manually scale the chart axis minimum and maximum values as desired if you do use +999 dBm as the null value. This just keeps things reasonable in case you prefer to let the charts auto-scale. Besides, +100 dBm is good enough in most instances. Enter the lower and upper frequency range for calculating the system response inclusive of filters and frequency conversion stages. 175 equally spaced frequency steps are calculated for all stages. 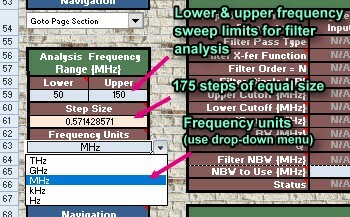 Depending on your system, you might want to do sweeps across the entire input band of concern, then do narrower sweeps that will provide finer detail within your smaller filter bandwidths. Note: the Lower frequency cannot be zero (0) because of the logarithmic horizontal chart scale. The smallest value permitted is 10-12, which is small enough to include 1 Hz even when the Upper frequency is 1 THz. Every stage can contain a frequency-dependent component which can be an actual filter or a model of the frequency response of an amplifier, cable, coupler, etc. RFCW checks to make sure all required inputs are present and alerts you if they are not. For example, if you select a bandpass filter and do not enter a lower frequency or if you use a Chebyshev and do not enter a ripple value (or if you enter invalid values, like lower frequency greater than upper frequency). As with the filter specifications, every stage can have a frequency translation. That means there is no limit to the number of frequency conversions your system can have, although from a practical standpoint you will probably never have more than three. RFCW checks to make sure all required inputs are present and alerts you if they are not. Frequency-dependent power levels based on filter responses and frequency translations are calculated separately from the other system cascade calculations (NF, IP2, IP3, etc.). Along with the filter response, all nominal stage component gains are included. Results are plotted in the "Frequency Response" ("Signal Power vs. Frequency") chart. These frequency-dependent gains and power levels are not used in any of other cascade calculations (NF, IP2, IP3, etc.). Note that frequency and power levels presented this matrix are actually calculated in cells below Row 540, but are done this way to conveniently place power levels next to their associated frequencies while making data selection for the chart simpler (take my word for it).